Russia has played a new opening move in the contest with the United States and it could be called “The Syrian Gambit”. In the tradition of chess, a “gambit” is a move whereby a chess player gives away a minor piece to position him or herself better to defeat their opponent. To the beginner chess player, a gambit appears counter-intuitive because their opponent deliberately suffers a loss and the advantage only makes itself apparent later. By which time, if the gambit has been played well, the neophyte player is already suffering a disadvantage. John Kerry now famously made a rhetorical offer to Syria that if it gave up all its chemical weapons they could avoid an attack from the US. Much to Kerry's consternation, Sergei Lavrov, the very capable Russian Foreign Minister, said he thought it was a good idea and would discuss it with President Bashar al-Assad. That same day Assad agreed to give up Syria's chemical weapons in exchange for not being attacked. The Gambit was offered. And now the US is very rattled and nervous about accepting. Contradictory messages from various US administration staff seem to follow each other almost by the hour. The reason Syria won't go the way of Iraq or Libya is because of one fundamental and decisive difference: Russia is standing firmly by Syria's side (with its warships off the coast of Syria) and has said repeatedly that it will not allow Syria to be attacked by the US or anyone else. Assad, in explaining why he agreed to the Russian initiative, said it was because he had full confidence in Russia's protection of Syria. So Syria is offering to give up an asset from amongst its arsenal of weapons. How will it gain from it being accepted? The chemical weapons (CW) were becoming a liability and their military value is very limited. So not much, if any, value is being surrendered. Assad has said that the idea of CW was to counter the threat of nuclear weapons. But how likely is israel to attack Damascus with nuclear weapons with both Tel Aviv and Jerusalem little more than 210kms (130mls approx) away as the wind blows? On a battlefield, chemical weapons need to be deployed by specially trained troops and these soldiers need to be in the right terrain at the right time with the right weather conditions for them to be effective and not be harmlessly dispersed, or worse, not blow back on their own soldiers. If the enemy soldiers have gas masks, any advantage quickly dissipates. Holding CW may have value as a deterrent against the civilian population of a neighbouring country contemplating an invasion. But once they are fired at said population, the deterrent value evaporates while leaving the offending country open to being targeted by other surrounding countries and/or abandoned by their allies. Targeting the enemy's civilian population does nothing to improve the immediate military situation at hand. So making the announcement to surrender the CW nipped that false flag (and any others involving CW) in the bud. On the plus side, it takes away the excuses of the US to invade. They no longer have to prevent Syria from using them or prevent them falling into the 'wrong hands' (assuming those are different hands from the ones that the US and Saudi Arabia are already supplying with CW). Syria can be seen as serious about working for peace and as an example to all the countries that are condemning Syria who ALL have stockpiles of CW! All these countries and especially the US and israel are now on the defensive. Syria now has the 'high ground' (or centre control) by jettisoning a liability - a pawn that was actually in the way. Awesome James! I believe you are 'spot on' - and for confirmation, check this out. Pepe Escobar linked this on his Book of Faces wall a little while ago - a tres interesting piece of obscure Russian history. I just can't help it....big cheesy grin ...you are one of the few my friend! Well, i don't know about that but it wouldn't surprise me. He made a joke about the link when he posted it. I haven't agreed with some of his analysis lately but I still like him and he is very funny. He posts some hilarious comments, pics and links on his wall on a frequent basis. Excellent analysis James. This is one of the strangest games being played out that we have seen. I'm afraid to even guess what the next moves may be. I'm afraid to even guess what the next moves may be. Whatever the next move is, Kenny, it won't be war. There is a very good reason that no one in the US, either in the administration, the Pentagon or the media will talk about the Russian naval fleet off the coast of Syria. Nor will they talk about Putin's repeated messages that Russia will stand by Syria and will not allow an armed foreign intervention. And absolutely no one wants to link the presence of the Russian fleet to Putin's words. At the end of a long statement, coming as the response to the last question in a press conference in Moscow on August 26, 2013, Russia’s Foreign Minister, Sergei Lavrov (above), delivered what might be useful to understand as an anthropological statement on international relations, specifically on the treatment of people[s]. It is reproduced here in full, given the almost total absence of such! ideas and perspectives both in our own mainstream media, and certainly never to be heard coming from the mouths of our ruling political elites. Below, Lavrov speaks on law, freedom, surveillance, and especially in the final paragraph here, attitudes of civilizational superiority that deny the dignity of others. (Minor edits were done to the translation, for clarity)." "All those, who think that they will be able to establish laws from the epoch of lawlessness, probably act short-sightedly. It will definitely catch up with them later. You can pick any sphere, and it is always better to follow the rules, to respect peoples and help them reach an agreement with each other, rather than thinking in categories of “gunboat diplomacy”, stop to be sick [nostalgic] for the colonial past, the epoch, when they needed just to whisper for everybody to show servile obedience. The world is changing today. It is impolite and short-sighted to perceive other civilisations as second class groups of the population. It will catch you up sometime in the future. We need to avoid the war of civilisations in all possible ways. We are for dialogue, for the alliance of civilisations. But in this case we need to respect each other’s traditions, the history of those communities, which become more and more significant on our planet, to respect the values, which have been created, established for centuries in these societies and were transferred from one generation to another. It is so simple – if you wish to get on well within your neighbours in your village, the same principles apply. A disregard for such principles in the international arena costs much more for taxpayers as well, and, the worst – for peoples’ lives, who then become “collateral damage”. This terrible term (collateral damage) was invented to justify the gross violations of international humanitarian law and is rooted deeply in those, who promote concepts like “responsibility to protect”, “humanitarian intervention” – when the motto of human rights is used to disrupt the most crucial right – the right to live…." Sergei Lavrov said it is simple and it is. Respect one another. . . . and isolate those (the psychopaths) that won't. I am just catching up with you -- sorry to be so slow about things -- but I have to say you have done excellent work here. Or as a wise reader once said: Where else one can find such informations, thoroughly arranged in the sequence of logical thought? I have no doubt you are right. And it is amazing to see how some other "analysts" are covering the story. Congratulations on cutting through the dish, and on presenting it in such a thoroughly logical sequence. These are powerful informations and enlightening discussions, and the entire community deserves your utmost of praise and appreciation. Thanks very much, WP. I wouldn't be doing this if not for the support I receive here. And a belated thanks for reorganising the front page. It works! "Because the moment the full military operation was launched, Head of the Russian Intelligence Service contacted the US intelligence and informed it that “hitting Damascus means hitting Moscow, and we have removed the term “downed the two missiles” from the statement to preserve the bilateral relations and to avoid escalation. Therefore, you must immediately reconsider your policies, approaches and intentions on the Syrian crisis, as you must be certain that you cannot eliminate our presence in the Mediterranean.”"
Thanks for the link, Mick. Great catch! It fits and sounds very plausible. Except that the article states that the British Parliament voted against armed intervention in Syria after the missiles were fired (and brought down) which is incorrect. They voted before this event. The usual loud mouths are taking exception to Vlad telling them they are unexceptional. This is what they take away from his NY Times editorial. OMG it is embarrassing and I am not even an American. "Top US lawmakers were even less restrained in their criticism, with the chairman of the Senate Foreign Relations Committee, Bob Menendez, decrying Putin’s words as pure emetic. “I almost wanted to vomit,” the Democratic Senator from New Jersey told CNN on Wednesday. He also said he would love to write a response to Putin and on Friday McCain's spokesman, Brian Rogers, confirmed that he will submit a piece in the Russian newspaper Pravda. “We would be only pleased to publish a story penned by such a prominent politician as John McCain," Dmitry Sudakov, the English editor of Pravda, told Foreign Policy. McCain’s submission in both Russian and English is expected by next Wednesday at the latest. McCain is writing the American response in Pravda? God this is embarrassing. McCain's ongoing legitimacy is an insult to the intelligence of every American. I feel for you NJT! I laughed when I read the bit about McCain threatening to respond. The guy has trouble putting a coherent sentence together. And here I had been thinking nothing could be more embarrasing than our PM, Harper, and his loud mouthed gang of cohorts. This gives me hope. La Syrie sous l’ombrelle nucléaire russe!! IRIB - Russian president Vladimir Poutine, spoke Monday on Russian commitments in return for the syro-Iranian approval of the initiative proposed by his country to eliminate the chemical arsenals of the Syria. In the first place, "renunciation of Syria in its chemical weapons would effectively implemented simultaneously to the renunciation of the United States to the use of force." This Declarationla Syria under the nuclear umbrella Russian. means a clear Russian commitment to the security of the Syria as being a strategic ally in the front of the United States and the West. Secondly, "the Syria considered its chemical arsenals and strategic weapons in the front of the nuclear weapons of Israel". This fact implies that Israeli nuclear weapons are now under discussion and would be long-term, part of any comprehensive settlement of the crisis in the region. But the question of these weapons would be during any negotiation around the Iranian nuclear issue, in the short term. However, the most important in this statement, is the decision of Moscow to place Syria under its nuclear umbrella, he renounced the force chemical deterrent. In a few hours, the American war against the Syria was defused. The Russians announced the initiative to place the Syrian chemical arsenals under international supervision in return to stop the offensive. Damascus immediately accepted. Washington has responded positively but cautiously dummy; Indeed, the Russian Minister of Foreign Affairs, Sergei Lavrov, quickly revealed that the initiative was agreed with the US administration. The Russian president and his American counterpart had discussed the issue in full cleavage between their two camps. As such, the rules of the game between the two powers have been established; Damascus and Tehran have agreed with the Russians on the common strategy of the management of the conflict. But, on the other side, where subordinates, not allies, there are only surprise, disappointment and the lamentation. As if the head of the so-called "free Syria army", geignaient on behalf of Bandar Ben Sultan, Recep Tayyib Erdogan and other petty: we want typing, we want the impactor. But the world these days is that great; agents, traitors, and the rancuniers are just instruments. The American right daily, Wall Street Journal, has sympathized with these petty: the allies of the United States in the region cannot trust him more, he warned. The newspaper warned of the possibility of the loss of American power in Egypt. This country will be the price allocated to one who will win the victory in the region. The ongoing conflict is very complicated. It contains several tangled folders. Points to be agreed and other loans to explode. And if we do not ignore sizes and roles of the different regional and international forces, we need primer the first truth to understand developments and anticipate them. The conflict takes place between the two major powers: the Russia and the United States. In the Arab world, several leaders, politicians and policy makers do not understand or do not want to understand that the period of the unipolar world is already over and that Usthe Syria under the Russian nuclear umbrella. 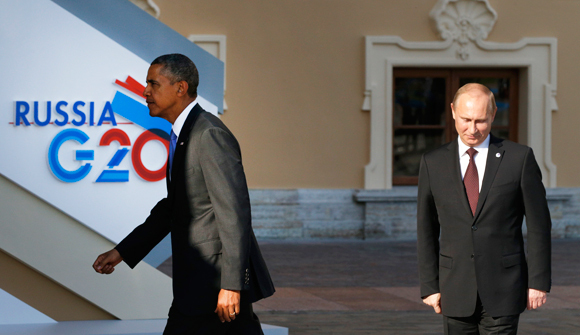 are now in full phase of the multipolar world in two camps, Russian and American. More here including a commitment on Russia's part to expedite the full S300 missile system to Syria. In a stunning article linked here by Dublinmick (higher up in this comment thread), a Russian intelligence chief is quoted as saying to the Americans, “hitting Damascus means hitting Moscow". The above article from Iran French Radio quoting Vladimir Putin confirms it. I'd say that's "Game, set and match. Thank you linesmen; thanks you ball-boys!"